Hawthorne Cat’s team of trained service professionals provide the service and support you need along with unmatched customer service. 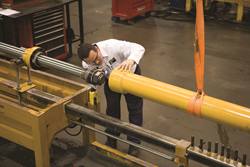 Hawthorne Cat, the exclusive Cat® equipment dealer in San Diego, the Hawaiian Islands and the Pacific Region, announces a new special offer on Hydraulic Cylinder services and parts. Now through August 31, 2017, bring in any Cat hydraulic cylinder group including cylinder assembly, rod assembly, head and piston for repair and receive 15% off parts and labor. This offer is only available at Hawthorne’s San Diego and Waipahu (Oahu) locations. Choose Hawthorne Cat for hydraulic repairs to eliminate unnecessary system failures. We offer full services including cylinder repair, pump rebuild and custom hose assembly. Our highly trained technicians will disassemble the cylinder group, inspect it, hone the barrel, polish the rod and reseal with genuine Cat seals. Count on the Hawthorne Cat team to ensure sure your equipment is running smoothly.